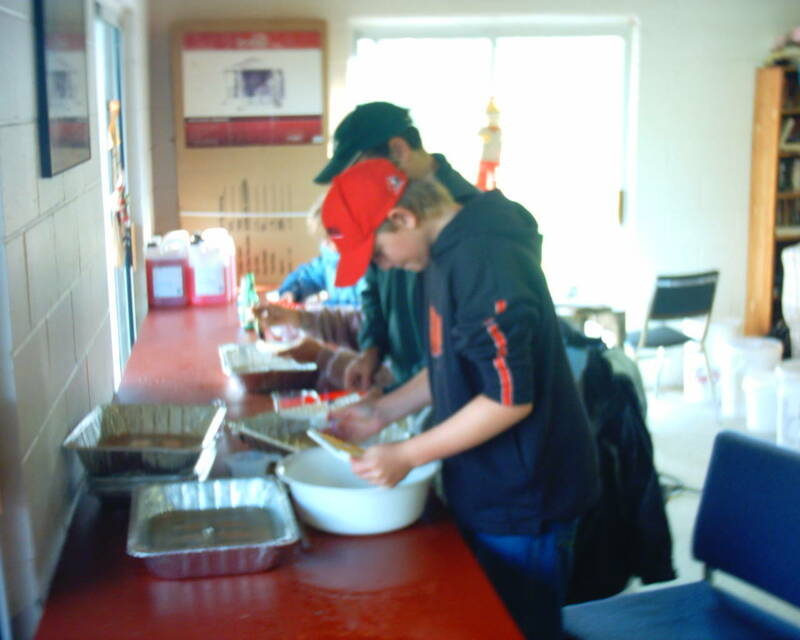 Welcome to our Brown Trout Hatchery section. You will find articles on one of our egg collections, with appropriate pictures. You will then see our success rates using Scotty incubators and then we have an article on how we use the Scotty incubators with pictures. We have also included 2 articles on Brown Trout that you will probably find interesting that we wrote and were published on Water and Woods Fishing magazine. 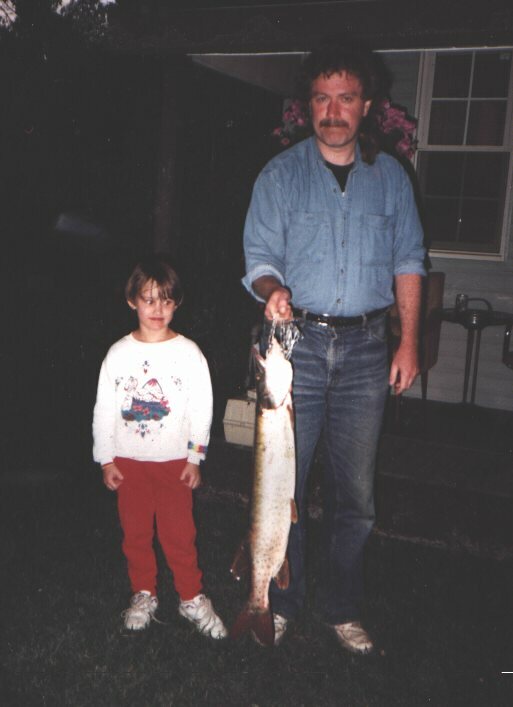 Here are a couple of pictures of us shocking the river to capture the brown trout. Andy Mckee (Ministry of Natural Resources, on the right with the Ghostbusters pack) and Jim on the left, walks through the water and mildly stuns the fish, while we capture the fish using nets. Tom was really good, he captured 3 in one scoop…great Tom!! The shocking does not harm the fish, as we only send the current through the water in short bursts. When Andy would send a burst, the fish would be attracted to the current of electricity and for about two to three seconds become stunned. They had to very quickly net the fish before it escaped. It is surprising where big fish will hide. While working the river we had to be extremely careful of the new redds(nests) as we have to take advantage of the fish while they are in the midst of preparing to spawn. It was alittle harder to get eggs this year. Alot of the females had already spawned or were not quite ready yet. This year we had to go way back into the woods and rework the river to get the 6,000 eggs. Spawning is dependent on water temperature, sunlight, water flow levels, ect. We had lots of fun though (never seen so many fish), and it was very educational with regards to the habitat the river browns (salmo trutta fario) prefer. We learned how important cover is for holding areas, like low undercut banks, rip rap, small logs, ect. 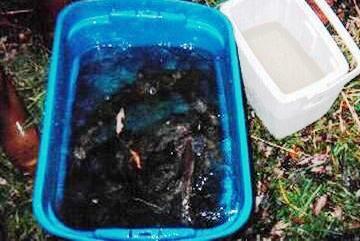 We kept the fish in holding tanks until we had completed an area and were ready to collect the eggs and milt. Here you can see the egg collection in action. Andy would gently squeeze the abdomen of the females and the eggs would come out. Sometimes the eggs were not ripe and even though she was full of eggs, we had to return her to the river to spawn naturally. Once we are finished with the fish, they are suspended in the water till they are fully revived and released. Some people may wonder if this will damage the fish by taking their eggs. This is actually very beneficial to a trout for a couple of reasons. Spawning puts a lot of stress on the trout when they spawn. They have to select a mate, build a redd (nest) in the gravel and this will damage their fins (possible infection) and burns energy just before winter when there is less food available. Also if the female trout does not release all her eggs, she is very susceptible to internal infection (cepcemia). The highest mortality of adult trout is usually immediately after spawning. Next some may wonder if there are less fish in this river system. Actually, there is not. A little know fact is that in a strong trout river (like this), there is usually insufficient spawning areas. What will happen is that one trout will spawn in one spot and 2 weeks later another female may select the same location to spawn. When she builds her redd (nest), she will clean out the eggs of the previous female, in order to lay her own eggs. There are a few scientific papers that have been written about brown trout spawning on previous redds (nests) and we actually have seen this in this river system. On the top picture, Scott holds a beautiful male brown we used as parent stock. Below this, Jim holds another parent. We used about 28 breeding pairs of parents. According to MNR standards, a fishery must have a minimum of 24 breeding parents in order to be viable. This is so that the genetic stock is variable enough to survive. We also crossed 2-3 males with each female to improve the genetic variability. These fish are going to make great genetic stock for the river. We try to capture new healthy stock every year. You might ask why we don’t just buy fingerlings and dump them in the river. When you buy stocked fish you don’t know where their gene pool has come from. Some fish farms use the same stock all the time thus reducing the strength of the gene pool due to inbreeding (exception, Normandale MNR Hatchery). We capture all our fish directly from the river thus avoiding inbreeding and weakening of the gene pool. The hatchlings will adapt easier (higher survival rate) to the environment because of the wild genetic parent stock. According to figures given to us by the MNR, we should get a 10% return on the eggs we hatch. Our hope is to get a good founding stock in the river and stream and then start seeding other portions of the Saugeen River and it tributaries. Here is another beautiful male brown trout held by Courtney, another great parent. We saw differences in the colour of the eggs we got. This is due to the primary food source of the trout. 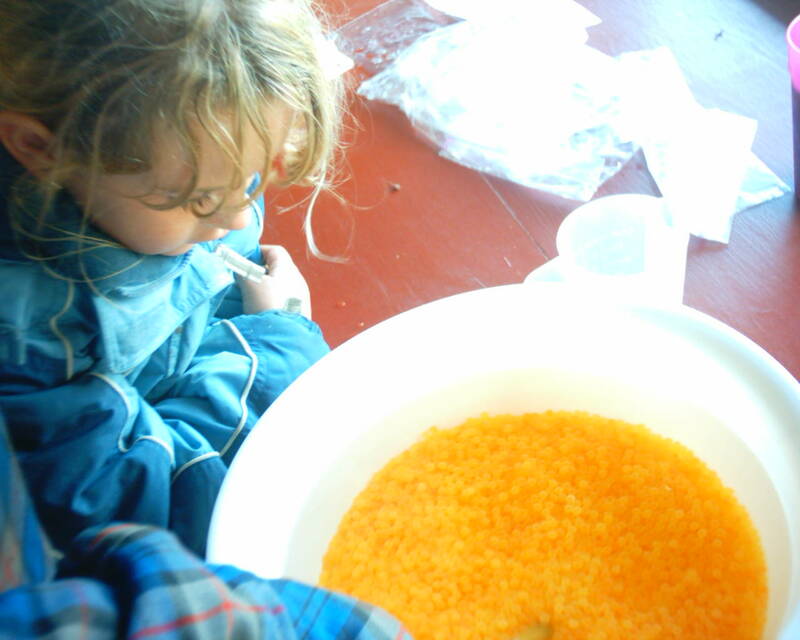 If the trout feeds primarily on crustations (crayfish), it will have a much higher cretin amount in the eggs (brighter orange colour). We noticed may different shades of orange and yellow as we milked the eggs. Now that we have the 6,000 eggs and milt, its time to get them back to put into Scotty incubators. First we mix the eggs and the milt. This will allow 100% fertilization of the eggs. In nature, this doesn’t happen; some of the eggs aren’t fertilized and just die. After fertilization the trout eggs must be water hardened. This is a process that allows water to pass through the cell membrane toughening the outer skin of the egg, making it less susceptible to damage in the redds (or in our case the incubators). It also washes the egg allowing the micro pile hole to close properly. The hardening process takes between one to two hours. Wayne hardens the eggs by continually circulating oxygenated water over the eggs. If this was not done the eggs would die. Here everyone are working on placing one egg into each cell. We use easy loading trays that help speed up the process. We are all busy as little bees at this point. 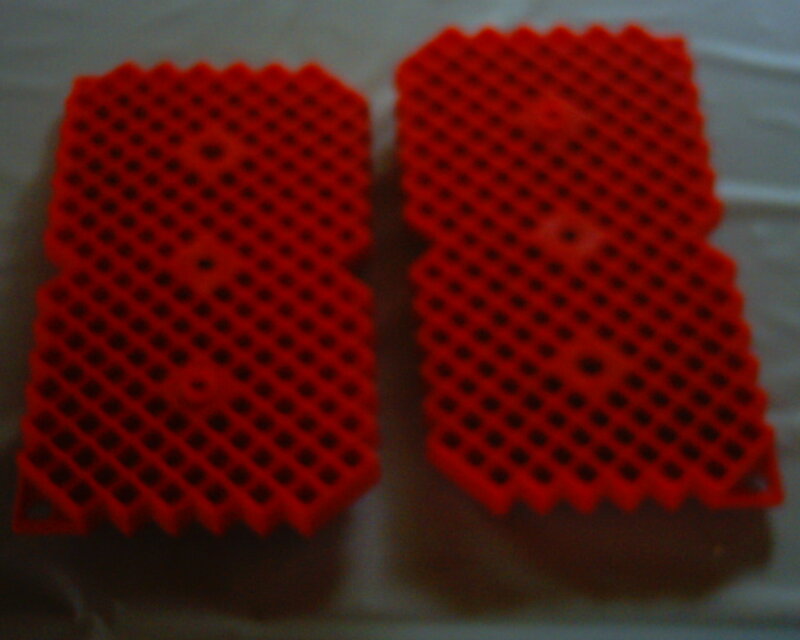 Here is a close-up of the easy loader trays. We found these extremely helpful in loading the eggs. Without the easy loader trays it would have taken us more time to load the incubators. To spread the eggs we use a soft new paint brush. This allows us to easily spread out the eggs without damaging them. We also keep water in the trays, as this allows the egg to be easily spread out (floating) and the eggs wet. Here we attach the incubators to large patio stones to be placed in the river at Saugeen Cedars Family Campground. Two incubators were placed on one patio stone in strong current and the other incubator was placed on a separate patio stone in extremely fast flow (and tied to a tree). We would like to thank Scotty incubators. They make great downriggers and lots of other products. The Scotty Corporation did all the research into making these incubators and sell them to river restoration clubs at cost. If your club is interested in purchasing some incubators, please feel free to contact me and I can direct you to Scotty. Thanks again Scotty. 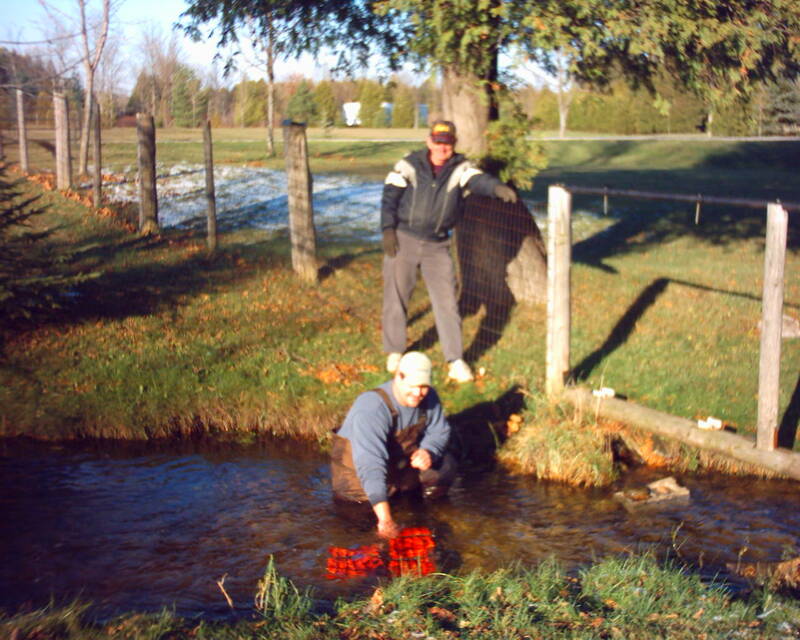 Scott and Ron are checking the stream where we placed 3,000 of the eggs. We decided to locate half the eggs in the stream as there is excellent habitat for juveniles down stream, and as a precautionary measure in case one area has a catastrophic incident. The incubators are very easily accessed from the road, and we can check their progress during the winter. In the spring time, around end of April, we can check the eggs with the easy viewing plate on the front of the first incubator. Ron Dubrick will also keep an eye on it for us. Thanks Ron! Well, sometimes there a challenges, but also successes. A couple of years after we completed the hatching of the brown trout, Andy McKee took a boat down the river and shocked the areas around where we hatched the fish. These are only a few of the fish they captured. These pictures speak for themselves…. We were recently asked to explain how the Scotty incubators work. Lets first look at the Scotty box itself. (click to enlarge pictures) Here is a picture of one of the boxes. Each box holds 1,000 eggs. 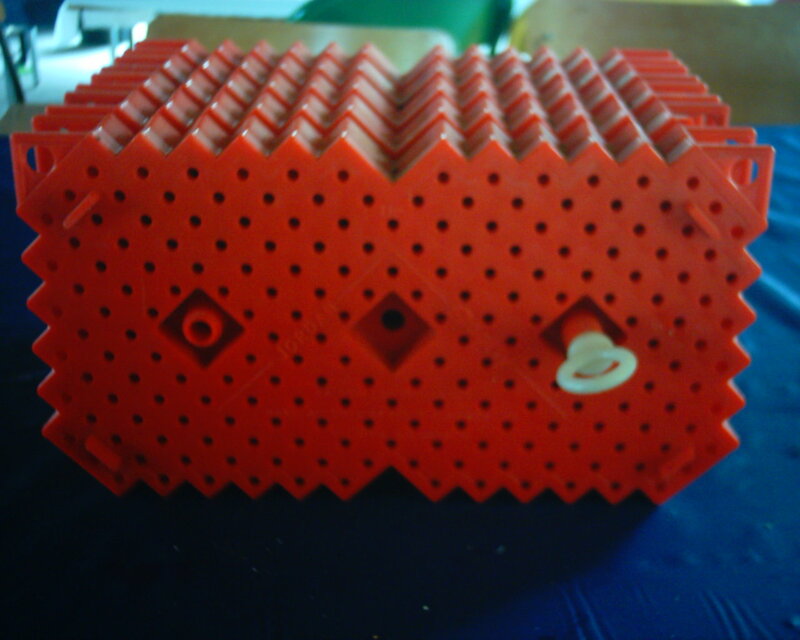 You can see the holes on the side. You place the incubators at right angles to the flow, so that the water flows through the little holes, supplying oxygen to the eggs while they incubate and when they first hatch. Picture 2 is a side view of the incubators. You can see the two halves of each plate. Each plate hold 200 eggs in it. There are two half’s to the plates, both identical. Picture 3 shows one of the plates that hold the eggs. When you put the eggs in the bottom half, you place the top plate on top creating a little cell and this holds the eggs in place. It should be also noted that the eggs do not drop through the holes. The eggs of brown and rainbow trout are larger than the holes. Scotty has 2 types of incubator boxes, one for trout and one for salmon. The salmon eggs are a little larger than trout. Picture 4 is a close up look at one of the cells that holds the egg. They are designed to allow the water through and the sand and silt will not remain in the incubators. Sand and silt is one of the major factors in reduced egg hatches in all trout redds (egg nests). Sand and silt will smother the eggs. 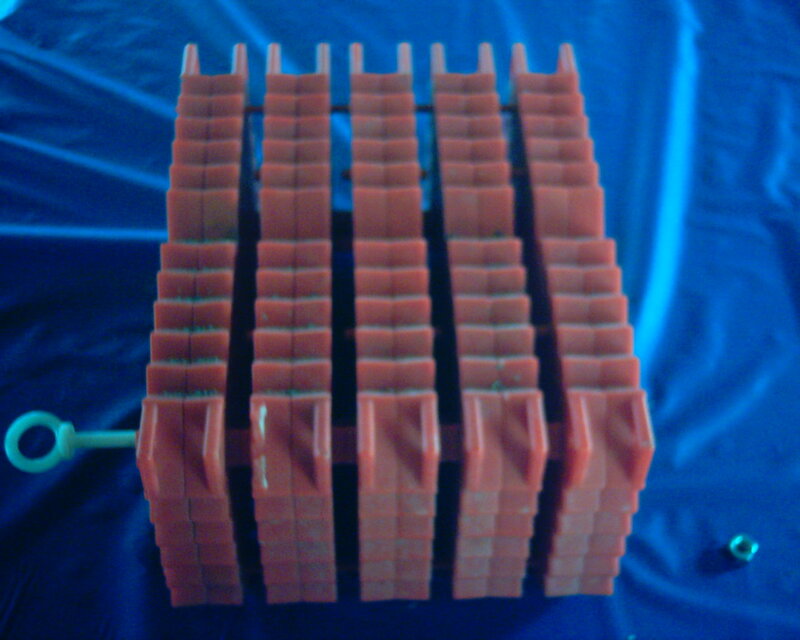 This revolutionary design allows the water to flow through without sand and silt build up. It is very important that the incubators are placed (and remain) in the upright position during incubation If not, the silt and sand will plug the incubator and the fry will be trapped in the incubators and die. The right side up is easily marked on the incubators. When the egg hatches (for brown trout this is usually between April 1st and May 24 and is temperature dependent), its still too large to escape the incubator. It has its bright orange yoke sack to absorb. When this is almost completely absorbed, it swims out of the incubator, through the holes (downstream). It will immediately bury itself in the gravel and develop further and then emerge as a trout minnow. We have experimented with the incubators over the years and found some interesting facts. The major challenge for egg hatching for brown trout and salmon, is freezing during the winter. River levels in the winter drops dramatically (to similar summer levels) and reduced flow may freeze the eggs. There are two solutions to this challenge. One is to bury the incubators in gravel where the flow is high and the second is to place the incubators in the deepest and fastest flow. The easiest method we have found is to secure the incubators to a large patio stone (5/8 inch rods) and place it in the deepest and fastest water, securing them to the river side (we tie them off to a tree), so spring floods do not wash them down the river. We hope this will help your club. To find further information, check out Scotty’s website. We would also like to thank Scotty for their development of these incubators. They sell them to clubs at cost. •	Incubators were covered with up to three inches of sand and fine gravel. •	Droughts are a normal occurance in any river system, as are floods. 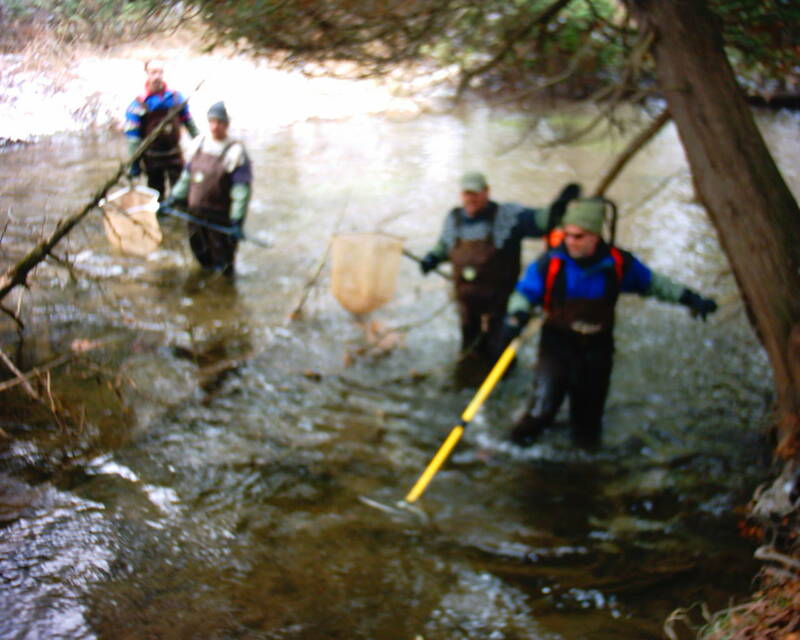 •	We placed 3,000 eggs at Saugeen Cedars Family Campground and 3,000 in the stream. •	Spring was terrible. High river levels did major damage through the whole Saugeen watershed, and a cold wet spring. It now starting to warm up, the eggs are hatching now, we will keep our fingers crossed!! 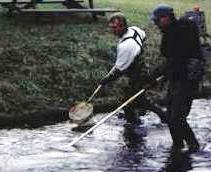 •	The eggs placed in the stream had a lower hatch rate than the incubators in the main river. Overall, we had a great hatch with 84% hatch. We also confirmed that higher flow rate=higher hatch rate. No eggs in 2004-2005 due to abnormal weather. We normally get our eggs the first weekend of November, but all the trout were delayed in their spawn due to warm fall weather. •	We went and got our eggs later this year due to the warm fall. Had just enough volunteers for egg collection to make the day go smoothly. The new easy loader trays designed by Scotty Downriggers was a tremendous help. We had all the eggs in the incubators in less than 1 hour (after they were water hardened). •	It has been an abnormal winter. December saw good cold weather and snow, however shortly after Christmas, the weather pattern changed and all the snow melted and significant rainfall has increased the river levels to their maximum. River levels are usually the lowest in the mid summer and again in Jan/Feb. This is because any precipitation comes as snow and does not soak into the ground until it melts in the spring. We are not sure of how this will effect our hatch rates in the spring, however the warmer water will make the hatch time earlier than the normal May hatch time. Water temperature dictates speed of hatch. •	Checked incubators in Feb 2006 and ropes that are tied to trees from the patio stones have been cut at the water line. Since there was no ice in the river this year, it must have been the beavers. We had 4 in the park this year. They were bringing small branches from trees they felled along the river bank. The beavers are amazing, they dropped a large tree right between 2 trailers with no damage to either, amazing. Solution air craft cable next year. •	Tried to check incubators in early March, but major flooding in whole river. River is at 20 year high. We found the incubators washed downstream, one set is good, second was caught on rock weirs in middle of river. No way to safely get at. •	River levels came down on Easter weekend. Still too high to get to incubators though. One patio stone now exposed to air. Not sure if fry escaped in time. Just when the divergence between the Atlantic salmon(salmo salar), and the brown trout(salmo trutta), occured is unknown, but there is large scientific evidence showing that they have a common ancestor. Recently found chromosome differences between the Atlantic salmon(56-58) and Salmo trutta(80) clearly separate the salmon and brown, but the similarity of the markings of the juveniles and parr (yearlings and fry) are strong evidence of a recent heritage. Behnke’s recent research show that both brown and salmon have the same amount of DNA(weight). If the brown trout evolved by partial chromosome doubling, it should have 40% more DNA. Because the amount is approximately the same for both, it seems that the brown trout is the ancestral form and the Atlantic salmon is derived from it, by fusion of some of the chromosomes. The salmon has many long one-armed chromosomes, apparently a fusion of two-arm brown chromosomes. The brown trout is an extremely polymorphic species. This fish adapts very quickly to the environment that it lives in. During the ice age (prior to the great flood), most of the British Isles and Northern Europe were covered with ice, and almost all freshwater fishes would have been eliminated in the regions of glaciation. 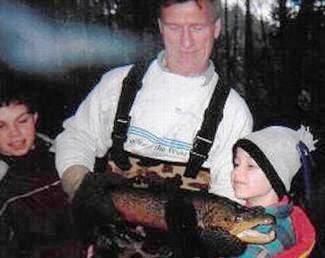 There are a few isolated brown trout populations that are still present today up in the mountains. They have found these isolated distinct populations by measuring the genetic marker LDH eye enzeme. The ice forced the brown trout southward, permitting these forms to invade the Mediterranean, Black, and Caspian seas. The glaciation was not continuous, however, and alternate advances and retreats of ice (along with the brown trouts repopulation in accesible locations) and separate geographical areas, most likely resulted in long periods of genetic isolation, allowing genetic differentiation to take place. Thus, the different types of brown trout. There is considerable genetic diversity among brown trout populations of north-western Europe with any indiviual population containing only a limited part of the genetic variation present in the species(Freguson 1989). There are even distinctive, reproductively isolated sympatric populations present(in Sweden, Ireland, and Spain). This is why, at one time, there were as many as 50 separate "species" of brown trout. Lets look at the history of the classification. Carlolus Linnaeus, in his historical work "Systema Naturae", published in 1758, named three types of trout in Sweden by the binomial nomenclature now universally used; S.trutta, the trout of large rivers; S.fario, the trout of small brooks; and S.criox, the migraratory sea trout. Then in Gunthers 1866 "Catalog of Fishes in the British Museum" described 10 species of brown trout from the British Isles that deserve special attention because of recent phylogenetic and taxonomic studies. These are; the river trout(s.fario), sea trout(S.trutta); great lakes trout(S.ferox), Loch Leven trout(S.levenensis), Welsh black-finned trout(S.nigripinnis) see picture, the Irish gilaroo,(S.stomachicus), the western sea trout(S.cambricus), the eastern sea trout(S.brachypoma), the Galaway sea trout(S.gallivensis), and the Orkney sea trout(S.orcadensis). By 1930 David Jordan, Carl Hubbs, and others argued that the separate species should all be accorded one name "Salmo trutta L." and had been accepted by virtually all taxonomists as the proper name for the various forms and descriptions of brown trout. So, that’s the end of our story, wrong… In 1932, L.S. Berg, a highly respected Russian authority of fishes of Eurasia, agreed that all forms of brown trout deserved to be recognized as belonging to one species, but saw enough differences in geographical subdivisions to recognize six subspecies stemming from geographical separation: northern and western Europe(Salmo trutta trutta), Black Sea and trib. (S.t.caspius), Caspian Sea and trib. (S.t.caspius), Mediterranean region(S.t.macrostigma), Lake Garda, Italy(S.t.carpio), and Sea of Aral and Amu Dar’ya River(S.t.aralensis). 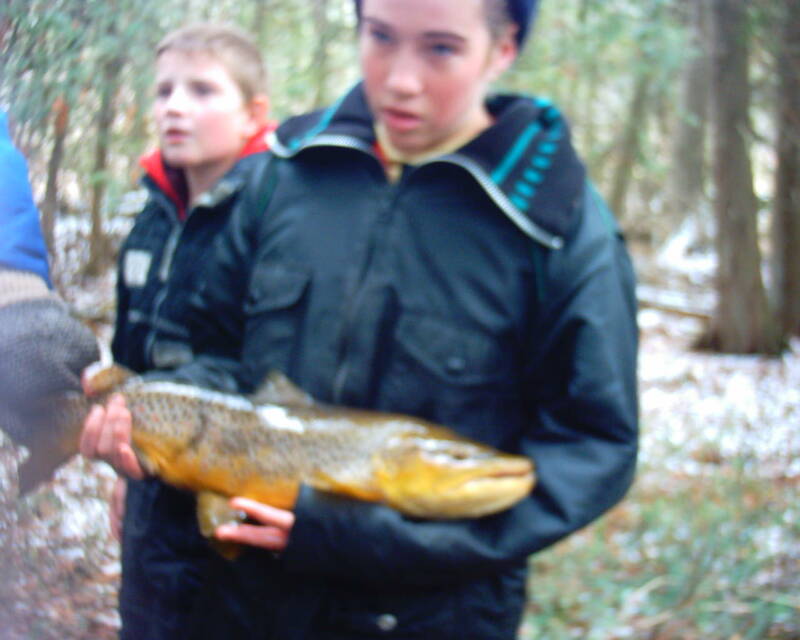 Brown trout (salmo trutta) are not native species to North America. 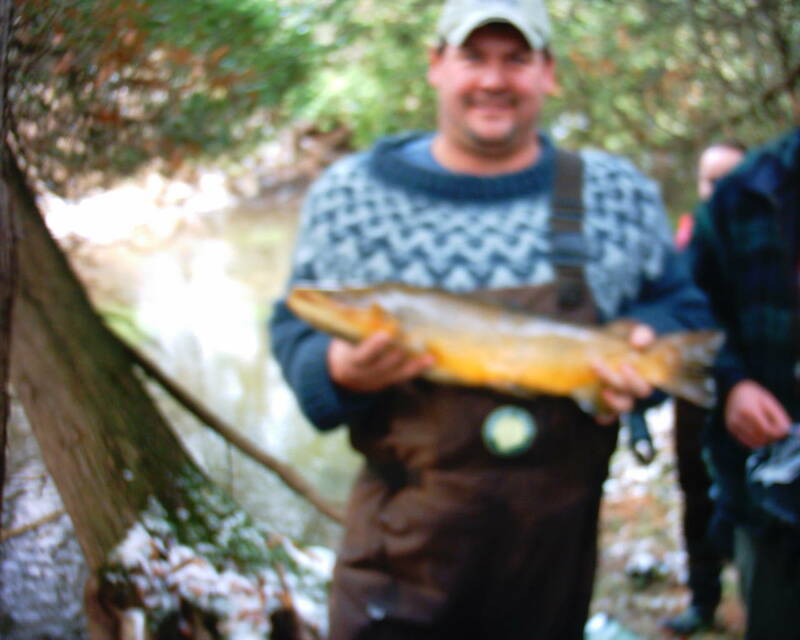 The first documented introduction og brown trout was on April 11, 1884, J.F.Ellis stocked 4,900 brown trout fry(von Behr strain) into Michigan’s Pere Marquette River. After this initial distribution in 1884, distribution of brown trout was swift and wide. The first North American introduction of Loch Leven trout, Salmo trutta levenensis (a lake form), appears to be made in Long Pond near Saint John’s, Newfoundland, in 1884. The sea run strain (S. t. trutta) was also introduced around this time but, the only currently known strain exists in Nova Scotia and Massachusetts. 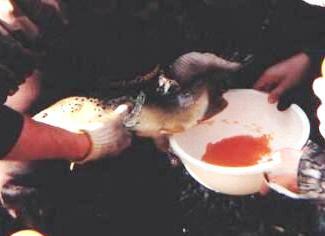 After the first North American introduction of the Lock Leven (see picture) trout occured in 1884, brown trout were introduced into every province except Prince Edward Island. Incredibly, there was little or no attempt to keep the Lock Leven and the von Behr strains isolated or distinct. Goverment and private fish distribution records listed both types, but widespread shipment from one hatchery to another (crossbreeding), and the introduction of both strains into the same waters apparently resulted in the merging of the original distinguishing characteristics. Perhaps we should now discuss the differences between the two strains. . The von Behr trout, (S. fario) lived in small streams, were brightly coloured, and rarely exceeded the lenght of 12 inches. In contrast, the Loch Leven trout, (S. levenensis), was a lake-dwelling form, silvery gray with black spots, reaching a size of 18 lbs. If, as reported, the von Behr and Loch Leven strains have been widely interbred and broadly distributed, and if the brown trout has a plastic genetic ability(polymorphic), I’m not surprised that North American brown trout are, in appearance and life history, similar to practically every form originally described in Europe. All three different types of brown trout were introduced into our waters during the 1800’s, but recently C. Krueger and B. 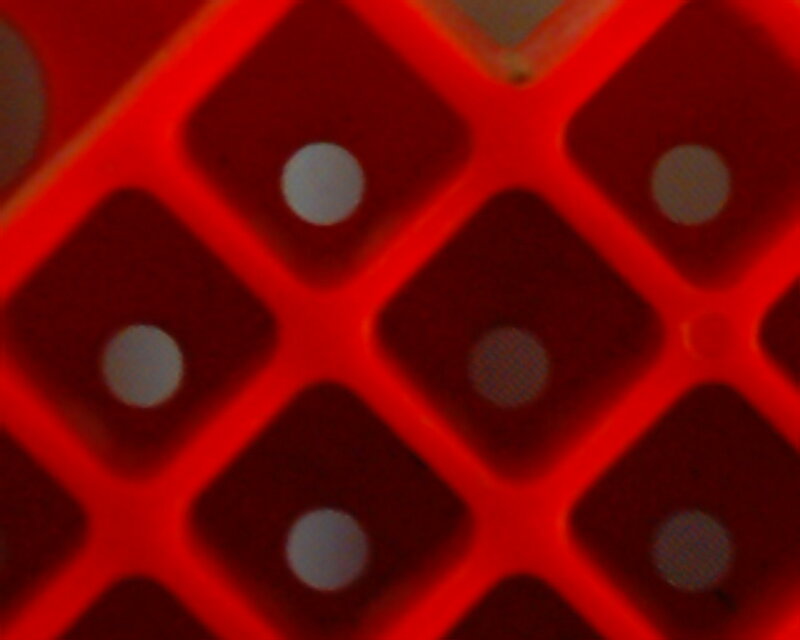 May discovered that the populations are becoming genetically differentiated. This is extremely important for fisheries managers. 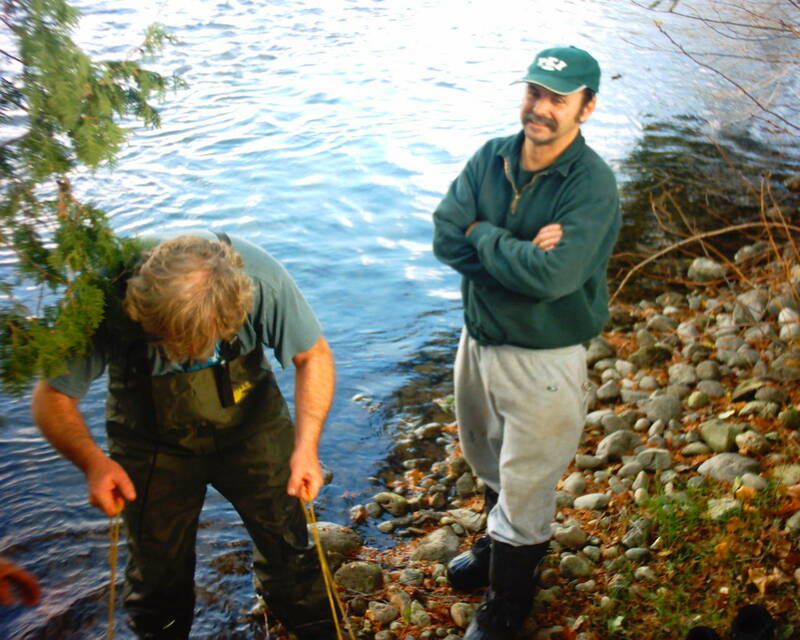 They studied the allozyme data of brown trout from Lake Superior and came to some interesting conclusions. The differentiation among hatchery stocks was 2.2 times greater than that observed among the 8 samples from wild populations. Similarly, the differentiation between the two groups (hatchery and wild) was also larger than that observed amomg samples from wild populations. They also found that the level of differentiation observed in Europe appeared to be greater than that observed in Lake Superior, but the amount of differentiation was highly significant because of their so recent introduction. 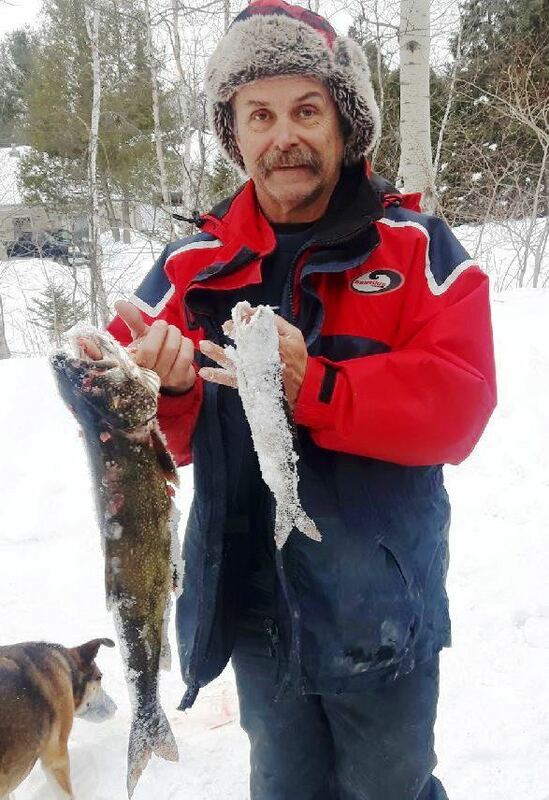 The existance of multiple brown trout stocks in Lake Superior implied that reproduction-isolating mechanisms occur among populations of brown trout. 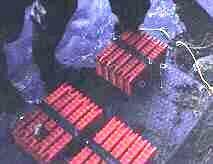 They are also quickly adapting to their enviroment(polymorphic) through genetic selection. Ryman (1981) noted a general tendency of brown trout from European waters "to aggregate into close and genetically distinct populations." They concluded that the genetic differences could be due to 1) to rapid rate of population differentiation since stocking through the effects of small founding populations coupled with assortative mating based on precise homing behavior, or 2) to the partial preservation of the original genetic characteristics of the different European stocks that were introduced into the basin. Personally, I think that both factors are present. Brown trout spawn from the last week in October until the middle of December, with peak spawning occurs in early-mid November. After reducing their food intake in August due to low warm water temperatures, September (usually cooler and wetter) sees a dramatic increase in food consumption as they prepare their long spawning runs. They have to increase their food intake in order to develop the eggs and milt(sperm) for spawning, and for making their long and arduous runs up the rivers to their spawning beds. Once the water temperatures drop to about 12C and the photoperiod(ratio of sunlight to night) and water levels are right, they start their migration runs. Their homing ability to their natal streams is absolutely amazing. In one experiment they took 50 female and 50 male brown trout from their natal stream (after they had run up to spawn), brought them across the lake and placed them up on spawning beds on another river. All the brown trout returned to their original stream, except for one male brown trout (guess he met a real cute female along the way, nature like real life..lol). Their amazing homing ability will return them to exactly the same location from which they were hatched. Once the female reaches the spawning grounds, she starts looking for the proper habitat to lay her eggs. She is very selective on the location of her redd (nest). She prefers a water depth of 24-45cm, but will spawn as shallow as 12-18cm. Water velocity also has a major determination on spawning site, water velocity optimal range 40-70cm/sec. Potential spawning sites are characterized by upwelling water through gravel or by water currents flowing downward into the gravel. Water hydraulics are extremely important in allowing water will flow through the gravel to the eggs. As you can see the completed redd picture on the left (pictures courtesy of Andy McKee M.N.R.) on how the water flows upwards through the redd’s gravel (flowing left to right). They prefer gravel sized from 3-15mm, but will spawn in what’s available. Gravel at 8-12mm will allow excellent flow of water through them while trapping sand and silt in the upper 10 mm of the redd (forms a sand/silt barrier), but allowed water to pass through the redd to the eggs. Now that she has selected her spawning site, she will start to make her redd (nest) and select her mate. She will dig out a hollow in the gravel, with her tail, using a fanning motion. This will help loosen and remove sand/silt and debris from the redd. The male brown trout will chase off competing males for the right to spawn with her. Once water temperatures drop to 7-9C, and photoperiod and water levels are right, spawning will occur. The female swims into the hollowed redd she has made and the male swims beside her. As she releases her eggs into the redd, the male releases his milt into the water in order to fertilize the eggs. Sometimes a smaller male jack will sneak in on the other side of the female in order to spawn (sneaks in for a quickie..lol). This is actually beneficial to diversify the genetic stock.